Trim the beef and marinate in the remaining ingredients. Minimum of 2 hours, maximum of 4 hours. 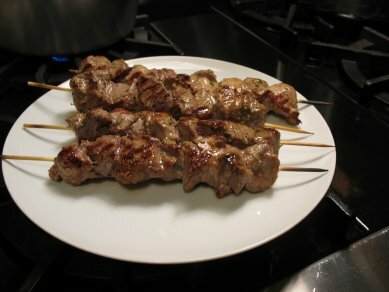 After 4 hours remove the skewers and place in a clean container and discard the juices from the marinade. Serve 2 skewers per order. Each skewer will have 6-7 pieces of beef. Grill over a hot charcoal fire to the doneness you like. To serve they should be placed on a plate and served with rice. 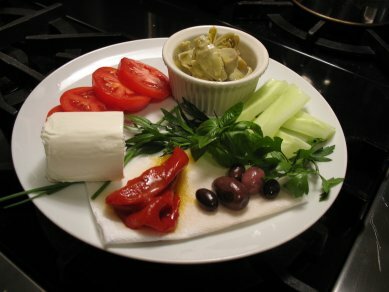 I like to serve with warm pita bread and the ingredients in the picture above; tomatoes, marinated artichoke hearts, cucumber chunks, roasted red peppers, goat cheese, black olives and fresh herbs. * You may serve with Hummus or Tahini Sauce and additional olive oil drizzled on the vegetables. I also like hot sauce sprinkled on the beef.